Sometime in 2003, I came across a book entitled The Artist's Way by Julia Cameron. It is a workbook: exercises to do and list of questions to work through. It made me think about the creative process. And it helped me to write with a different sense purpose. One of the assignments at the beginning of the book was to write three pages of whatever was running around in my mind. Write in long hand, just whatever was there. Then throw the pages away. I would write, but I liked the process and what I was writing and decided not to throw my pages away. Instead, I buy an inexpensive composition book. I like college ruled pages. 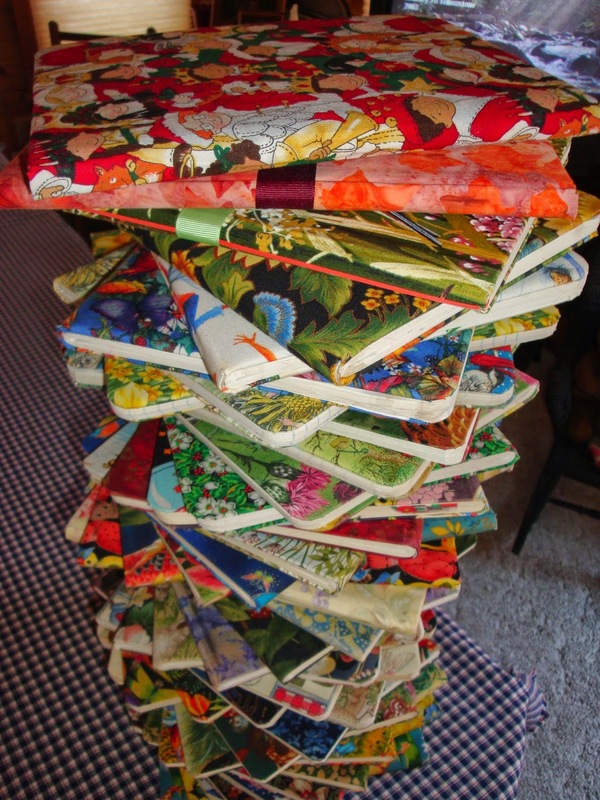 I cover each one with a favorite fabric from my stash, (1/3 Yard) or one I buy on a trip, or one someone has given me. Sometimes the fabric is seasonal. Sometimes it is just pretty fabric. I use Heat and Bond..the original heavy stuff...to cover the composition book. And then I set to writing. As I fill one journal, I look for the next fabric. I have numbered my journals; yesterday I wrote in the last pages of journal #57. This morning I began #58. Essentials for my morning writing. My morning pages have become part of my daily ritual. The alarm rings, the coffee grinder begins to buzz and the coffee brews...set on a timer. I get up, brush my teeth and wash my face. No TV, no news, no radio. I pour my coffee in a favorite tall china mug. (They call them "beakers" in England.) I settle in to my favorite chair, usually with a quilt on my lap. I read the daily entry from The Book of Awakening by Mark Nepo, and then I write. These journals have opened me to deeper creativity. They help me work through anger, grief, separation, sadness as well as reminding me of the joy, grace, peace, and gratitude for the goodness in my life. When I began this writing, I was simply hoping it would open my creative block. What I discovered was that it opened me to more than just my creative ideas. It has moved me to be more present, open and receptive to the world in which I live. It has deepened my faith, and taught me about quiet meditation, and sometimes, simply silence. I am present more, listen more, see more, and find simple joy is every day. And sometimes a journal almost speaks to me out loud. The journal I was writing in when my marriage fell apart-- literally came apart at the seam, and the cover fell off. I held it all together with a rubber band and some gross grain ribbon until I had written on every page and could move on to the next one. It was never in my plan to continue the journal writing this long. I had never been one to keep up with diaries and journals. Somewhere along the way, it has become a habit. I write almost every morning. If Emma sleeps over, there is no early morning quiet time. 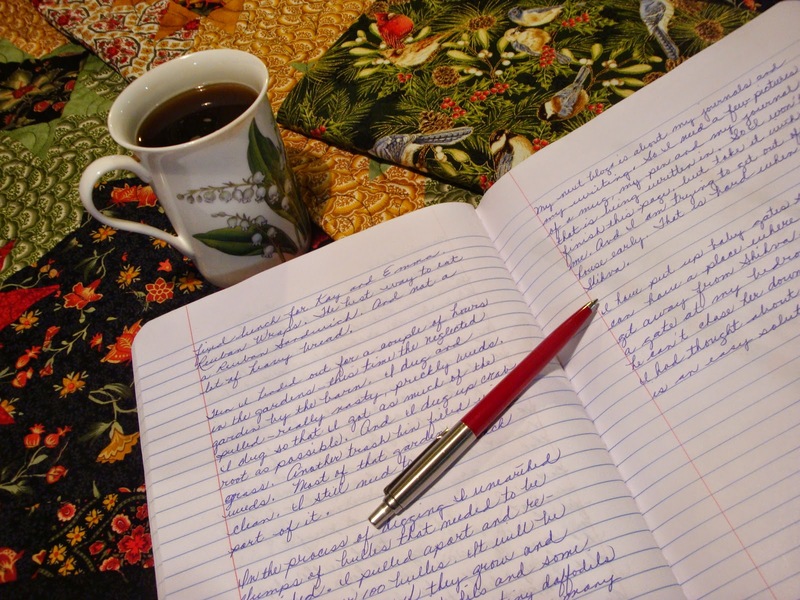 When I go to worship Sunday mornings, I leave the house earlier than on weekdays...and I have not gotten into the habit of getting up earlier so that I can write. Sunday my writing happens in the afternoon. But my favorite time is to write first thing in the morning. 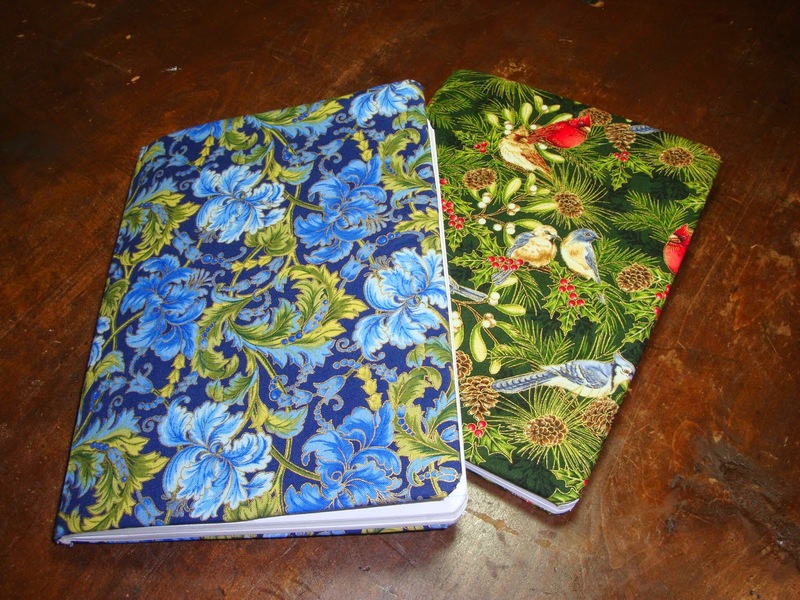 All of my journals are covered in a different fabric. It is a wonderful stack. I used to think that they might make good reading for my family when I am gone. Now I look at the stack and think they probably won't have the time. But if they want to know how I was feeling on a certain day, they can go back to a date, as I sometimes do now, to read about where I have been, what I was thinking, and often how I was feeling. And they will know what has been important to me as the years have gone by.